Overland by four wheel drive, it takes the better part of a week, is expensive and you may have to turn around if the roads are blocked by landslides. 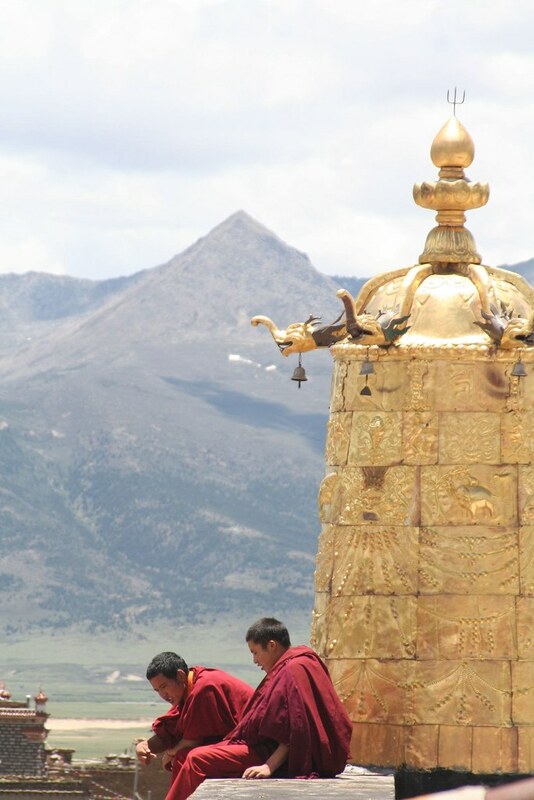 Fly in from Beijing or Chengdu – Less expensive, faster, but since Lhasa has become a “destination” for Chinese tourists it’s lost some of it’s charm, and you really need to get out into the country to “feel the Tibetness”. Take the Train – See number two, and it still takes three days from Beijing. So we decided a good alternative would be to explore some of the Tibeten Plateau without going into what the PRC government consider to be “Tibet”. Which you can now easily do in the western parts of Yunnan and Sichuan. After “Shangri-La”, a mildly Tibetan town, we headed up – way up – to Litang. Litang may not be part of Tibet (any longer), but it certainly has more in common with Tibet than with Han China. This little town was the hometown of not one but two Dali Lamas (the 7th and 10th). It’s the home of a lamasery commissioned by the 5th Dali Lama, it was heavily bombed when the PRC “consolidated” it’s control over Tibet, and oh yeah, it’s at an elevation of about 13,000 feet! Higher than Lhasa (more about that later)! A bus ride into town was full of amazing scenery, it was also a little hair raising. We crossed over quite a few high peaks, at the top of each the bus driver would throw Tibetan prayer flags out the window and shout something in Tibetan. The highest of the peaks was completely covered in snow, and it’s the middle of summer! BTW – I don’t know what the top elevation is for using your iPod, but mine stopped working for the duration we were in Litang. The town itself is located in a wide valley surrounded by high snow capped mountains, and populated by Tibetans, Khampa’s and a few Han Chinese. It was only opened up to foreign visitors in 1999, so you still get quiet a few looks from some of the older residents unused to seeing us “Foreign Devils” up close. If you visit Litang (and you should), please bring warm clothes and lots of them. The high temperature over the two days we were there was 51 degrees Fahrenheit, this is in mid-June! There was sleet falling as we ate supper our first night there. Seriously! Also, sunglasses are a must. The sun is blindingly bright up at that altitude. All this, but you have to go, the old Tibetan part of town is terrific, the people are extremely friendly and the monks at the Lamasery are very friendly. The monks here are such a big part of the economy that there are several “Monk Shops” on the main drag selling only monk related items – monk hats, monk robes, monk …stuff.